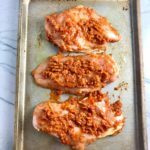 This ridiculously Easy Sun Dried Tomato Chicken has only 4 ingredients* and takes only 30 minutes from start to finish! It’s slightly sweet, slightly tangy, and hugely delicious! 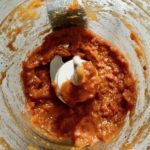 Sun dried tomatoes have an intense flavor, so a little goes a long way and when rehydrated and blended, turn into a thick and lucious sauce. The sauce coats the chicken keeping it moist and juicy when it simply bakes in the oven. It’s a perfect easy weeknight dinner that you can prepare ahead and cook quickly! *Note, the 4 ingredients do not count the water, salt, and pepper in this recipe. Delicious Flavor and Good for You! Sun Dried tomatoes are a wonderful ingredient to keep on hand in the freezer and pull out for an easy last-minute dinner. They are tomatoes that are dried in the sun so all of the tomato flavors and nutrients concentrate. Sun Dried tomatoes provide vitamins C and K, iron, and the antioxidant, lycopene, which makes them a healthy ingredient to add to your meals. Have sun dried tomatoes leftover? No problem! Try this delicious and easy Mexican Pasta Salad with Sun Dried Tomato Dressing! 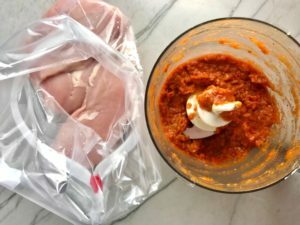 For this recipe, you can prepare it entirely in advance and let the chicken marinate in the tomatoes. Then simply cook in the oven when ready to eat! Start by making the sauce. 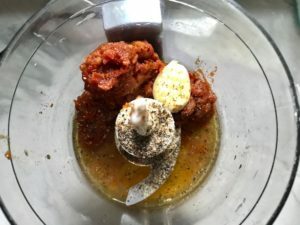 Add the Sun Dried Tomatoes, Olive Oil, Water, Garlic, Salt, and Pepper to a mini food processor. 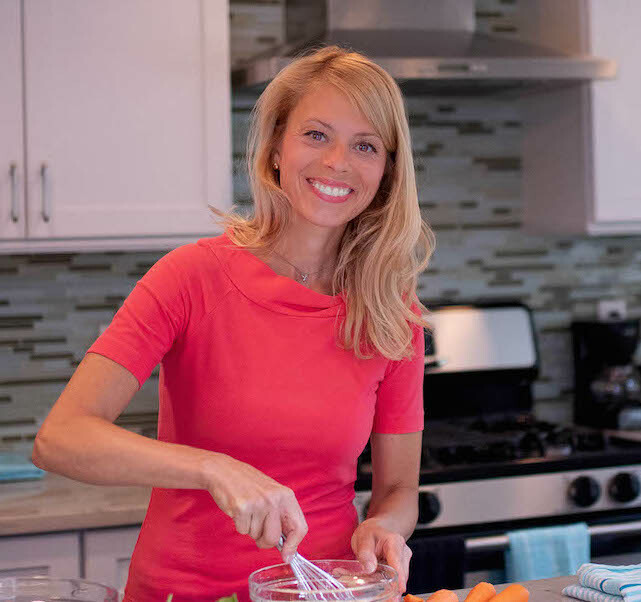 My Cuisinart Mini Food Processor is one of my absolute favorite and most used gadgets in my kitchen! 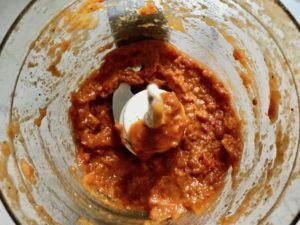 Pulse to blend until creamy with small pieces of tomato. 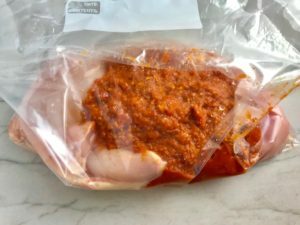 Add to 3 chicken breasts in bag, scoop the tomato sauce on top, then squish it around so all of the chicken is coated. Marinate overnight or just mix and then transfer to baking sheet pan. 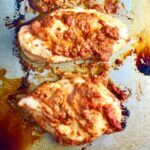 You can add a fourth chicken breast if you like, just check the recipe notes for ingredient increases. 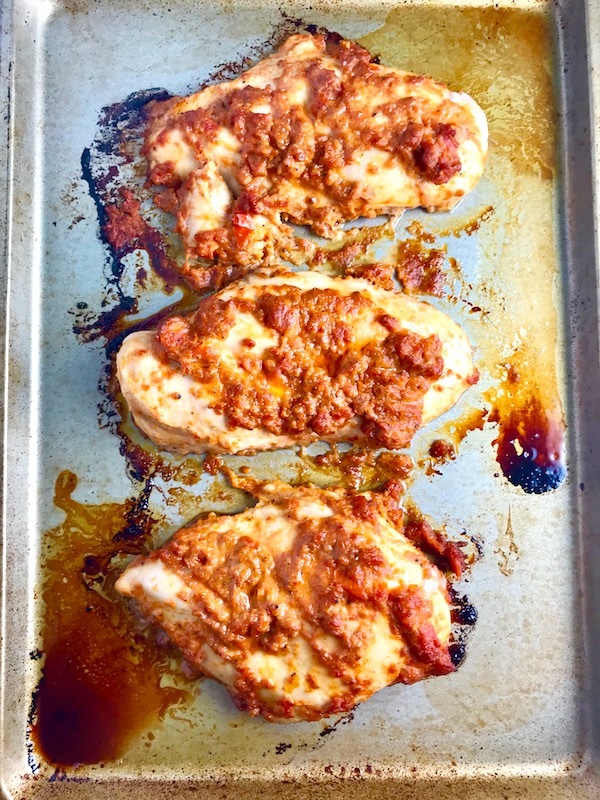 Place the Sun Dried Tomato Chicken breasts on an oiled sheet pan and bake in a 400F degree oven for 20 minutes or until the internal temperature reaches 165F. NOTE!! Let the chicken rest after you take it out of the oven! You want it to rest for at least 5 minutes so that the juices from the chicken redistribute instead of seeping out. This way, the chicken stays moist and juicy! 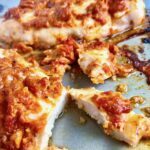 This Easy Sun Dried Tomato Chicken is slightly sweet, slightly tart and tangy, and hugely delicious! 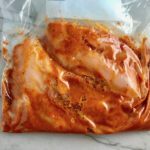 When Sun dried tomatoes are rehydrated and blended, they turn into a thick and lucious sauce that coats the chicken keeping it moist and juicy when it simply bakes in the oven. It's a perfect easy weeknight dinner that you can prepare ahead and cook quickly! 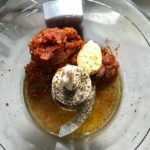 Add the Sun Dried Tomatoes, Olive Oil, Water, Garlic, Salt, and Pepper to a mini food processor. 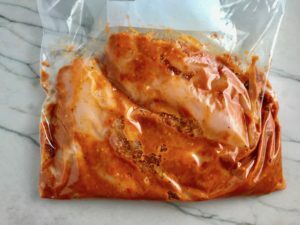 Add to 3 chicken breasts in bag, seal the bag and squish it around to coat the chicken. Then marinate overnight or just mix and then transfer to baking sheet pan for cooking. Preheat oven to 400F degrees when you are ready to cook. 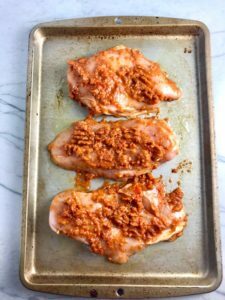 Place Sun Dried Tomato coated Chicken breasts on an oiled sheet pan and bake in oven for 20 minutes or until the internal temperature reaches 165F. Slice each chicken breasts into 4 slices on an angle. Serve each person 3 slices and Enjoy! Note, serving size here is about 6 ounces per serving. 3 Chicken breasts each about 8oz, can then be sliced and served in 4 portions. 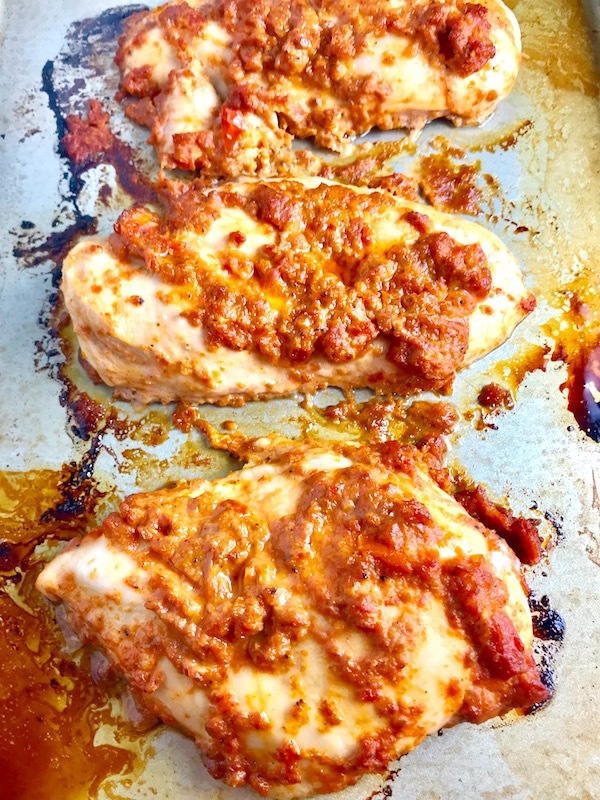 If you want to add a 4th chicken breast, simply increase the sun dried tomatoes to 3/4 cup and add a touch more water and olive oil to ensure you get a smooth texture with some small tomato bits. Oh my! 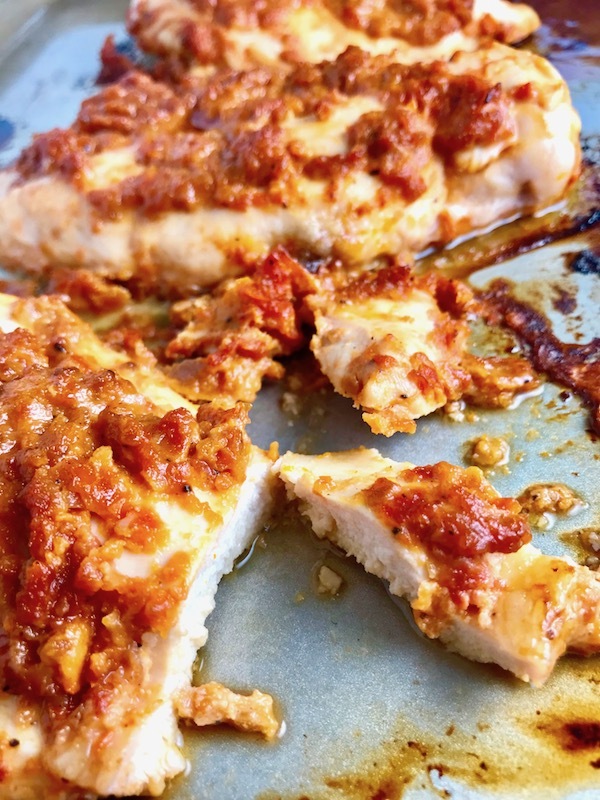 Sundried Tomatoes and Chicken are a match made in heaven. And the flavor from marinating it overnight would make it so scrumptious. Your chicken looks so tender. Thanks, Kristy! So easy, so delicious!